All teams to attend one working bee to validate entry. All teams to provide 1 CCDA approved marshal - training days will be arranged. The Free Entry Ticket to the winning team means a waiver of the entry fee of USD 2,500 per team and is inclusive of all entitlements accorded to any paying entry. This means hotel entitlement for pre and post event of one night each, event peripherals like car stickers, event group insurance, event sponsored items and all rights accorded to participants in the event. The winning ticket does not cover shipping and freight cost and any other costs arising from the team’s participation in the RFC. Working bees starting Sunday 17 April 9am - please confirm attendance. Next one is scheduled the Monday and Tuesday of Easter/Anzac Holiday. Please feel free to print out the flyer and distribute in your local area. Marshal training has been set. 1 day only May 1st. Venue is to be decided. * Note you will need to be financial CCDA members before attending. 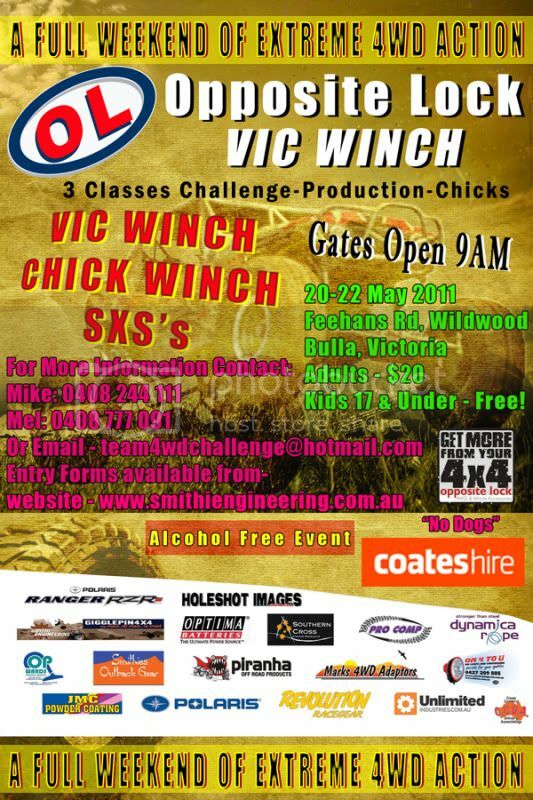 The Rainforest Challenge (RFC) would like to welcome all participants to the Opposite Lock Vic Winch Challenge and the Ateco Winch Challenge organized by Team 4wd Challenge. Australian 4WD drivers are among the best in the world and events like these will further hone up the driving and recovery skills of all participants. We wish to, therefore, salute the organizer for putting these events together. In the wider context of national social responsibility, such skills are not only for recreational off-road 4x4 but these will come in handy in times of calamities, in which we in the 4x4 fraternities are proven assets to the nation in reaching out to those in distress. Where no other cars are able to go, we 4WD drivers will be there to do our national rescue and recovery service. In showing solidarity with Australian 4WD drivers and the organizer, we would also like to support the winning team of each of the event with a Free Entry Ticket to this year’s Rainforest Challenge, which will take place from 3 to 12 December in Malaysia. This is the world’s most internationally represented event in which Australian 4WD drivers will be able to share camaraderie with participants, media and guests coming from well over 25 countries. We would like to wish everyone a great time in the Opposite Lock Vic Winch Challenge and the Ateco Winch Challenge.